This is the trailer for the second ever -crowd sourced- multi camera concert video registration. The entire concert seen through the eyes of Todd Rundgren fans' video cameras and HD smartphones. Peter Mader (who also supplied some great concert footage) interviewed Todd Rundgren in Amsterdam where he was preparing for his "Orchestral Extravaganza Phase II" and found out he was was extremely pleased with our video from last years concert. And since he told us no official recordings were planned, we decided to try and do one again, this time with Todd's blessing. 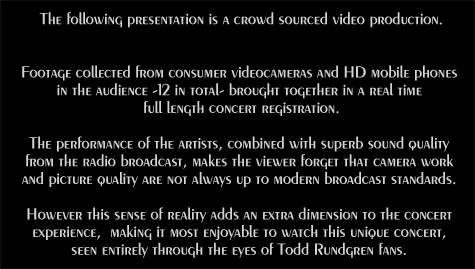 This is the trailer for the second -ever- Crowd Sourced Concert Video for the legendary Todd Rundgren & The Metropole Orchestra show in Paradiso, Amsterdam 11/24/2011. This time most of the footage was kindly donated and some was shared from YouTube clips, resulting in a feature length 150 minute full concert registration.